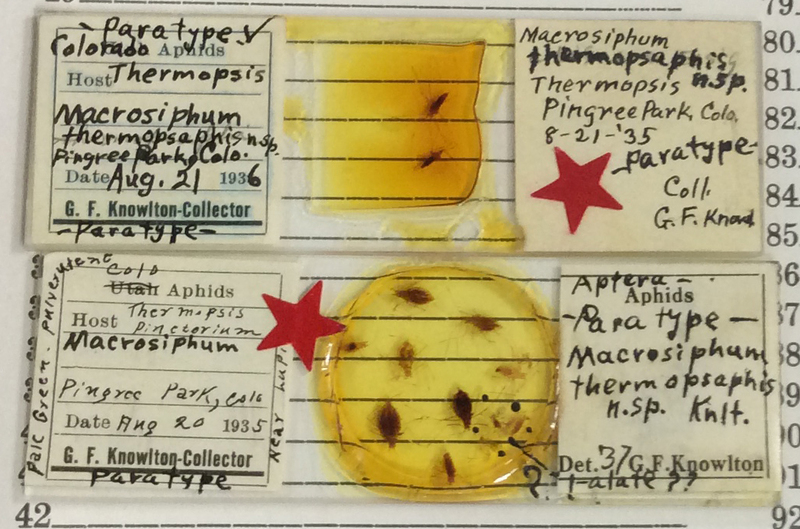 My aphid collection is over 8,000 slides, with probably at least 20,000 specimens (being entirely funded by my personal bank account, I conserve money and time by mounting 3 or 4 specimens on each slide) of over 600 identified species. In that collection are many interesting finds – apparently undescribed species, strange host associations, apparent range expansions, new North American records, unidentifiable material, specimens intermediate between recognized species, plus many specimens that beautifully support existing descriptions. I could probably stop collecting now and publish papers the rest of my life based on my collection and material borrowed from other major collections. The thing is that publishing papers takes a lot of time and effort, and actually costs a lot of money for “page charges” in most journals ($40-70 per page). Plus, who really cares about the natural geographical or host ranges of obscure aphid species… maybe 4 or 5 humans on the planet at any given time? Also, I get frustrated with digging up all those inane details about previous papers saying this or that, or using this or that name. In the end, none of it matters anyway because the world will end with the eventual nova of the Sun in a few billion years. Bottom line is that one big reason for this website is to tell people who care (those 4 or 5 on the planet, in case a couple of them are interested) what I know about the aphids I have studied all over the western U.S. and Canada (plus some other places) and do it in my own words and on my own terms. I promise not to coin new names, sink other people’s species inappropriately, move species willy-nilly from genus to genus, etc. I will simply tell you what I know, what I have seen, what specimens I have, show you some pictures, suggest possible interesting research angles, and whatever else comes to mind that does not violate the International Code of Zoological Nomenclature. I don’t care about publication credit, so feel free to follow up on any of my suggestions and pay those page charges for official publications that I am too lazy and cheap to pursue myself. I decided in 2014 to take this approach as I was walking through the forest somewhere in the Rocky Mountains. I have so much material in my collection, and have seen so many aphids living their lives in the wild, that there is no realistic way I could publish it all in my lifetime, not to mention the fact that I don’t want to hassle with the details and scientific rigor such as borrowing all possible material from across the continent, digging through historical records, and heaven forbid, handle the messy and opaque rules of nomenclature that I am so rusty on. This is all apart from the financial expense of page charges and the like for publications. Jeepers. So, why not just openly share everything I have and know about aphids, in case anyone cares, or maybe wants to take all the messy steps that I cannot or will not to finish the research and publish? This entry was posted in Uncategorized on June 27, 2016 by aphidman. Any of you who know about aphids of North America (i.e. approximately zero in the ecological scale of things) will know that G.F. Knowlton is one of the leaders of the field in the early 20th century, leaving us with much good, and not so good, research and taxonomy. For many years I have hoped to visit his collection, housed at Utah State University. Thanks to a Toastmasters event that Gina needed to attend, we both visited Logan over the weekend of May 19-22, and I had the chance to look through Knowlton’s collection for about 6 hours. 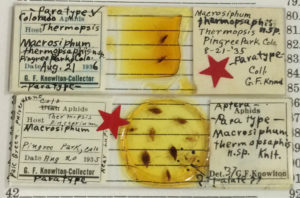 It was housed in slide boxes, similar to my collection, but the unidentified material was almost all lumped into 17 boxes without sorting to genus. I was interested to see that Knowlton collected mostly in towns and cities, and perhaps easily accessible countryside. I saw few slides from really challenging places such as we like to visit (see below). Some co-type material of a poorly known Macrosiphum aphid. It was good to see the material from his earliest days (1920s), in which he wrote enthusiastic notes on the slide labels about biology, host plants, etc. Some of the slides in the collection are badly prepared in a way that is so bad it is hard to describe. Others are very nicely done. I managed to find almost a full box of Macrosiphum in the undetermined material, some of which were very interesting specimens. One of my goals of the trip was to collect in Knowlton’s old stomping grounds around Logan. With a couple hopefully rain-free afternoons looming, I set out for a couple hours into Logan Canyon. My overall impression is that the Canyon would be almost unrecognizable to the 1930-ish Knowlton from a botanical perspective. Other than the shrubs and trees, almost all the plants visible this time of year were invasive weeds, from a series of grasses dominating the roadsides and understory, to dyers woad (Isatis tinctoria), to things like burdock (Arctium) two meters tall, and entire wet openings filled with Canada thistle (Cirsium arvense). Although the landscape was very green and lush, a closer look betrayed the fact that the weeds were the greenest part, and the native plants struggled to show their heads in the shadows and forest understory. In places where I’d expect an understory of Indian paintbrush (Castilleja), Agastache (horse mint), Delphinium (larkspur), and various composites, I found grasses. Epic grasses. Grasses so big that the snowberry struggled to see the sun through grass litter laid down last season. The weeds were well into their season, but the native plants were just getting started, and the extremely few aphids I found betrayed this fact, e.g. just-mature fundatrices of Nasonovia (Capitosiphon) crenicorna on Geranium and Pleotrichophorus on Achillea. 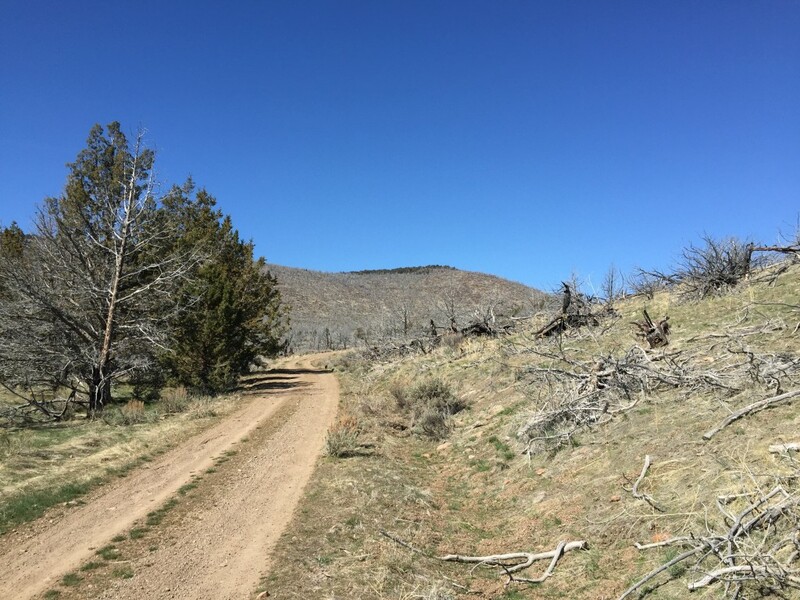 This was perhaps a place that inspired the rule we often see in the National Forests: “weed-free feed required beyond this point” except that the rule is way too late to have an impact in Logan Canyon (and the nearby Blacksmith Fork Canyon). The whole outing made me appreciate the Lakeview area, where even heavily used cattle pastures are waving fields of camas lily and other native plants this spring. The final leg of the trip was a one-night-camp, destination TBD (to-be-determined) on the way home. Several hours of map-gazing and Google Earth-ing turned up no good ideas for the second half of the trip home, so off we struck, hoping for inspiration. The Pine Forest Range from space, thanks to Google. After a dud of an exploration of a terribly overgrazed canyon, where the stream was nothing but a matrix of cow footprints, with cow eyes watched us from behind every bush, somewhere between the 400- and 500- kilometer mark of the drive we saw a sign pointing into the Pine Forest Range of mountains in northern Nevada toward Onion Lake and Blue Lake (U.S. Bureau of Land Management territory). 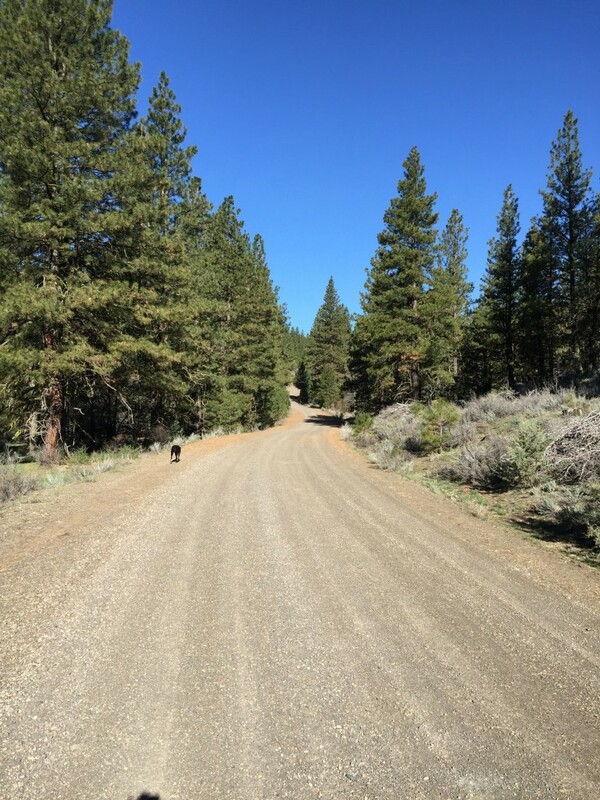 The road was wide and smooth and seemed not to go through any ranch homestead’s backyard (a common problem with roads in the remote parts of the western rangeland). We stopped in the paved highway for a few minutes to ponder (no traffic in sight for kilometers in either direction). In the end, “Why not!” Off we drove into the hinterland, the sign giving us confidence of good roads and sights to come. Bear in mind that the nearest town with an actual Main Street and things like a store and gasoline was Winnemucca, Nevada, about 109 km behind, or our home metropolis of Lakeview, Oregon, about 236 km ahead (we had recently passed a sign that said: “Next Gas 179 Miles” (that’s 288 km), that ‘town’ being Adel, Oregon that consists of a store-gas station-restaurant-tavern and precisely zero streets). We drove up a remarkably smooth dirt road for about 30 minutes to a potential camp spot, and waited for a bit to see of a rain shower would pass. Unfortunately, the mountain was creating the rain shower and it was not moving. So, up we climbed on the road. The landscape became more breath-taking with every moment, as did the lateness of the hour. About 90 minutes before sunset we picked a flat spot in a “saddle” at about 2200 meters elevation, and set up camp. By the time we had the tent set, the campfire going, and dinner almost done, the drinking water was starting to solidify and snow was threatening. But, the weather retreated, and we had a good sagebrush campfire ‘til late into the night. Next morning the frost was thick and the drinking water partly frozen, but we were well-rested under the many kilograms of bedding atop the lovely air mattress in our tent. As with every camping morning, I got up early to make tea, coffee, and breakfast, then struck out for some aphid-hunting and botanizing. There were three different sage brushes in the area, at least two species of Ribes, at least one Symphoricarpos, two species of Tetradymia, an Amelanchier, and my favorite, nestled in the rock outcrops, Holodiscus ‘dumosus.’ The aphids were just getting started at this elevation, but I managed to find some presumed fundatrices of Pseudoepameibaphis, Pleotrichophorus, and Obtusicauda on the sagebrushes, plus some immature fundatrices of something green on Holodiscus. There was much potential in the area, but ideal collecting season is still at least a month away in a site like that. Our camp spot down slope and the white bark pine forest far in the distance. The drive home took us through the rest of the ‘road’ across the mountain range to the valley beyond (this is an area known as ‘basin-and-range’ wherein there are frequent narrow and steep-sided mountain ranges alternating with dry salty valleys). We passed along the edge of the Pine Forest, which is extremely unusual in being a forest of whitebark pine (Pinus albicaulis). I really look forward to going back to explore the botany and insects in a whitebark pine forest at elevations of 3000 meters, one of the 5 or 6 whitebark pine areas in Nevada. This entry was posted in Uncategorized on June 8, 2016 by aphidman. We desperately wanted to get out this weekend, and in the face of a harsh weather forecast for thunderstorms near home in Lakeview but dryer to the west, we cast about for a place to try that A. would not be snowed in, and B. was interesting and would probably not be washed away during a thunderstorm. 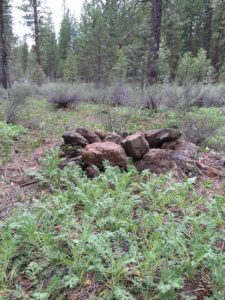 Looking at the map west of home, I found the words Devils Garden in a little sliver of national forest land north of Dairy, Oregon (Klamath County). On Google Earth, it showed as a round eruptive center from past volcanic activity, and it appeared there were some dirt roads right to edge of the rocky outcrop, which is about 1 kilometer in diameter. So, off we drove on Friday, once we cleared our day of conference calls, shopping, and tending the greenhouse. Devils Garden from the forested perimeter. About 2 pm we arrived at the edge of Devils Garden, and saw that we had made a good choice, assuming the storms didn’t make it that far west. The volcanic tuff is a mixture of rock types cemented together that then fall apart to form all sorts of bizarre formations. Gina and Bumble in one of them. The circular feature of ash flow tuff was clearly visible from the highway, and we just had to find a way down to it and select a camp site. Much rolling down sandy and muddy roads later, we emerged on the edge of Devils Garden. Unsure about a camp spot, we got out to walk around. It’s an amazing gem in southern Oregon, with unusual plants amongst very cool rocks and formations. We walked for quite a while, exploring the formations and biology. Wasn’t long before I was hopelessly “turned around” and lost. Fortunately we had a cell signal and we both had our phones. We texted back and forth to locate each other and head back to the truck. Even Gina, my human compass, had a hard time walking back to the truck, and we both learned something about “walking in a circle” when lost. 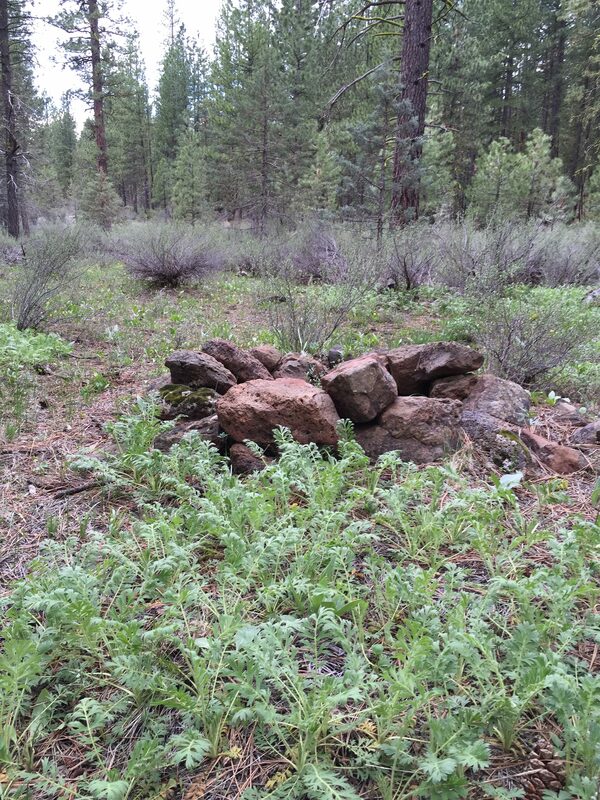 Under what looks like sand at Devils Garden is usually bedrock, hence the few plants. Geum triflorum growing around a long-abandoned campfire ring. species of Prunus: P. emarginata, P. subcordata, and P. virginiana. Much hunting, but no aphids on any of them. There were at least 3 species of Ribes in the area, and I did manage to find some Nasonovia (Kakimia) and Aphis (Bursaphis), but they were scarce. Two species of sagebrush scatter the area, but even they were very lightly populated with Pseudoepameibaphis. Purshia tridentata was everywhere, from dense forest to rock outcrops and open gravelly slopes, but only a couple aphids and psyllids were found. I managed to find one Braggia fundatrix on one of a few species of shrubby Eriogonum, a couple late-instar nymphs of Macrosiphum on a fern (which I was able rear to adult at home), and some fundatrices of Acyrthosiphon macrosiphum on Amelanchier utahensis on the edge of the forest. There is a drainage on the southeast side that is a dense aspen grove filled with Smilacina and Vicia in the undergrowth (no aphids, though!). The final highlight was sitting back at camp reading up on the various unfamiliar plants seen during the day. One was Leucocrinum montanum, a lily that was the first known host of an aphid I have studied extensively, Abstrusomyzus leucocrini. Leucocrinum montanum, a species known as star lily. I had never seen the plant before except in photos. Unfortunately, much searching both above and below ground turned up no aphids. Along the way of reading and resting at camp, we were visited by a solo pronghorn. It walk along the nearby dirt road, stopped to watch me, then when Gina moved in the bushes (she was studying the soil, her wont), the pronghorn bolted out of sight. The whole site is probably affected by the severe drought the region has faced over the past couple years. The wet winter and spring make the plants look good, but the drought has left its mark on the aphids. In many places these plants would have ended their life cycle last fall far earlier than aphids are adapted to, causing a terrible crisis for the aphids. But, I expect that by mid-summer the aphids will likely recover from their current population bottleneck, and may be extremely abundant in the fall. By Sunday morning, no rain had come, the weather had been mostly mild and not very windy, and we headed home fully satisfied with a weekend away from home. This entry was posted in Uncategorized on May 13, 2016 by aphidman. We had some unusual, almost summer-like weather this week, and it was too good to sit it out at my desk. An annual leave request complete and I was on my own for a day – or actually Bumble the dog and I were on our own. The road and forest only 16 km from home across the valley, Bumble exploring up ahead. This being our first spring in the Lakeview area, we stayed local to explore since everything is new. My first target of the day was low-land Ribes growing on the edge of the valley. Based on my reading today, it seems in this area there are two Ribes in this habitat, R. velutinum and R. cereum, the former with spines, the latter without. Despite much searching, no aphids were found on either. It was a very dry year in 2015, possibly explaining the paucity of Aphis (Bursaphis) and Nasonovia (Kakimia). Along the way of this first leg of our exploring, I found one adult fundatrix of Pleotrichophorus on Artemisia arbuscula. Somewhat surprisingly, I found a second-instar (-ish) fundatrix of Acyrthosiphon purshiae on its host, just breaking bud, Purshia tridentata. There were a few surprise plant finds too, including a patch of Ribes aureum along the streambank, and what seems to be a species of Primula growing in a seasonally wet draw. Along the stream grows a native Rosa, and on it I found a red Macrosiphum (?) fundatrix nymph. It is now in a jar on my desk, where I hope it matures to adult. On the one hand, it could be M. rosae, an unlikely event since this species usually does not overwinter as eggs in natural systems in western North America. On the other hand, it could be M. valerianae, potentially over-wintered on rose and soon migrating to the nearby Zigadenus (a.k.a. death camas). Ribes cf. velutinum in the greater Lakeview valley. A few flowers were just starting to open, attracting bumblebees, a welcome sound in spring. Purshia tridentata just sprouting leaves. Psyllids were common on this plant today, as is typical almost everywhere. Zigadenus, soon to bloom. 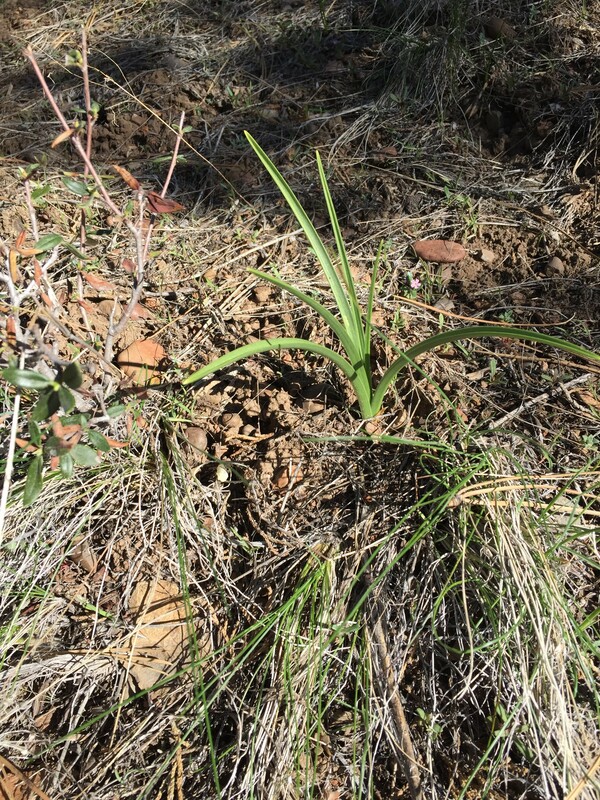 Unlike normal edible and nutritious camas, this is death camas and is aptly named. Our second stop of the day was Goose Lake State Park on the California border, about 20 km from home. 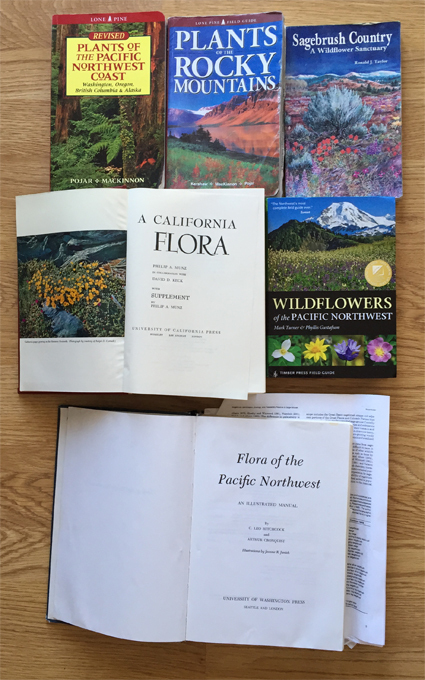 We had never visited, and I wanted to see what was there in terms of ecology and botany. Like most state parks, it turns out to be a heavily managed landscape dominated by exotic invasive plants other than the trees and shrubs. Aphis (Bursaphis) cf. costalis fundatrix on Ribes aureum, Goose Lake, Oregon. Despite this, I found a cluster of Aphis (Bursaphis) fundatrices (probably the species “costalis,” which is poorly understood) on Ribes aureum growing among the cottonwoods. Abandoning the creepy managed space of Goose Lake state park, we ventured back to Lakeview and drove about 2 km up Bullard Canyon, which leaves downtown on Center Street. There I wanted to collect the early spring forms of a mysterious Macrosiphoniella on an herbaceous Artemisia (success! ), and hoped to find the fundatrices of a mysterious Braggia on Eriogonum along the roadside (success!). I had found both aphids in the area last fall, and want to study them in more detail. A Braggia fundatrix in Bullard Canyon. 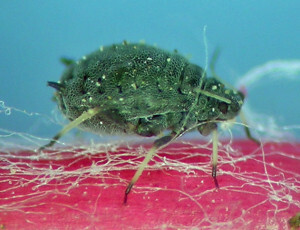 In the fall I collected this aphid and had a hard time identifying it to species. I am therefore highly motivated to collect more! Happy with these finds, and some wading in the stream for the Bumble, we headed home for lunch. After which I took my mountain bike and rode to the radio antenna towers outside town. Lakeview sits at about 1,463 meters above sea level, and the radio towers above are about 1,950 meters. It’s a tough ride to the top, but worth it. 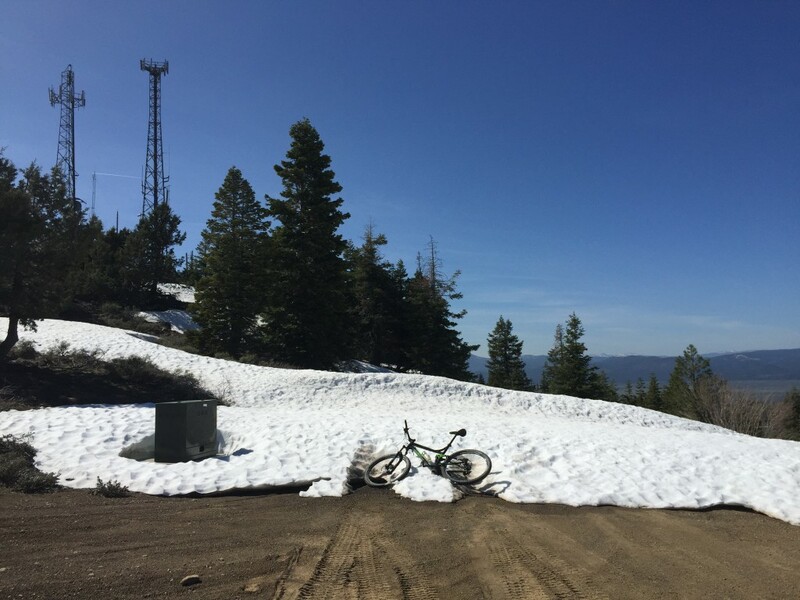 As you can see in the photo, there is still a lot of snow on the north-facing slope. Under all that snow is one of my favorite plants, Agastache urticifolia, and if I am lucky, one of my favorite un-described Macrosiphum species, only about 15 km by road from home (home is actually only about 2 km as the raven flies). The radio antenna towers and snow int he hills above Lakeview. It might be a month or more before the snow melts and Agastache starts to grow! It was about 23 C up there today. The final stage of our vacation day was looking for aphids around the garden — one should never neglect that! Few aphids are evident this time of year, but Myzaphis rosarum fundatrices are nearly developed to adult on Potentilla fruticosa outside my office window, and the seemingly omnipresent Rhopalosiphum oxyacanthae hatched a few days ago on both Sorbus (mountain ash) and Malus (apple) in the garden. Rhopalosiphum oxyacanthae fundatrix nymphs on our beleaguered apple tree. It was a good day. Bumble is happily tired, and samples await processing in the coming days! This entry was posted in Uncategorized on April 8, 2016 by aphidman. Our first full weekend outing of 2016 was to Juniper Mountain in Lake County, Oregon the first weekend of April. (As always on Aphidtrek, click on the photos to enlarge.) Just to put this place into perspective, Lake County is one small piece of eastern Oregon. This is the view from camp toward evening. In the distance is Hart Mountain. Probably fewer than 50 humans live between the camera and the mountains in the distance. 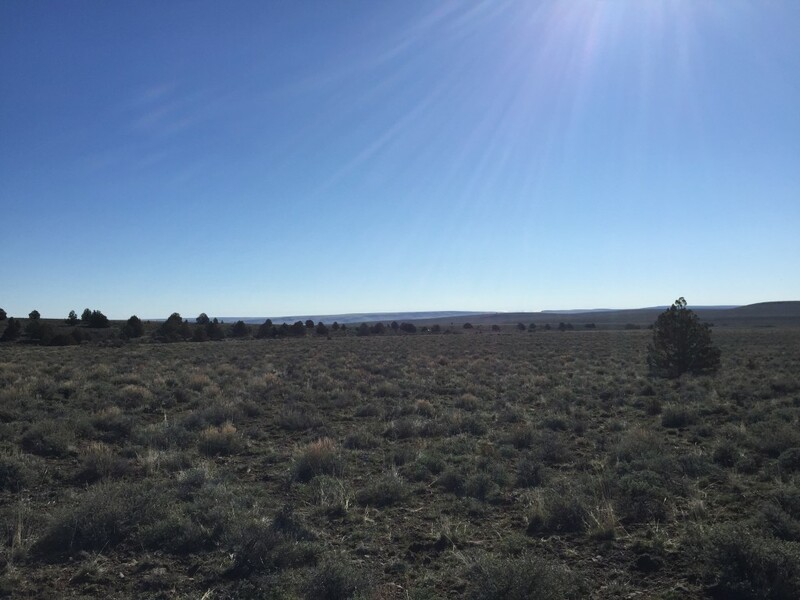 The sagebrush steppe shown here is typical. It is comprised of 21,432 square kilometers of land, in which about 8,000 humans live. That much land is about two thirds the size of Belgium (30,528 square kilometers). About 70% of Lake County is owned by the federal government and is open to the public for recreation. 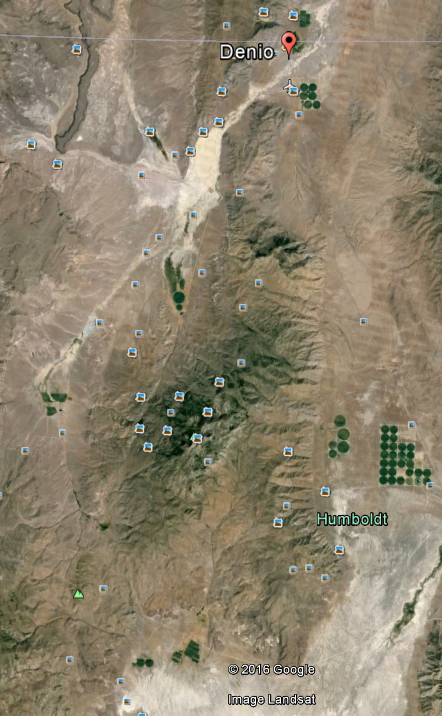 This time of year we stay in the desert lowlands which are managed by our Bureau of Land Management. 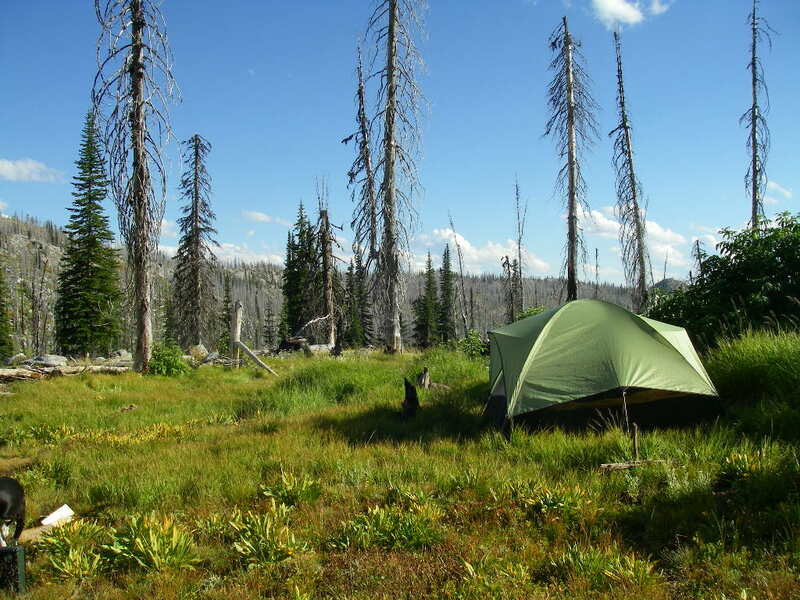 Later in the year we will climb into the mountains and camp on Forest Service lands amongst the pines and firs. On this trip we drove about 100 km north of home on our major highway, then turned off into what we call dirt roads, into the hills and desert, to reach Juniper Mountain. The motorized and un-motorized vehicles ideal for our kind of camping. 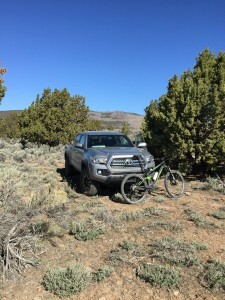 Another 15 km or so along roads of rock, dirt, and mud found us a campsite amongst the junipers and sagebrush with a view of thousands of hectares of uninhabited land. 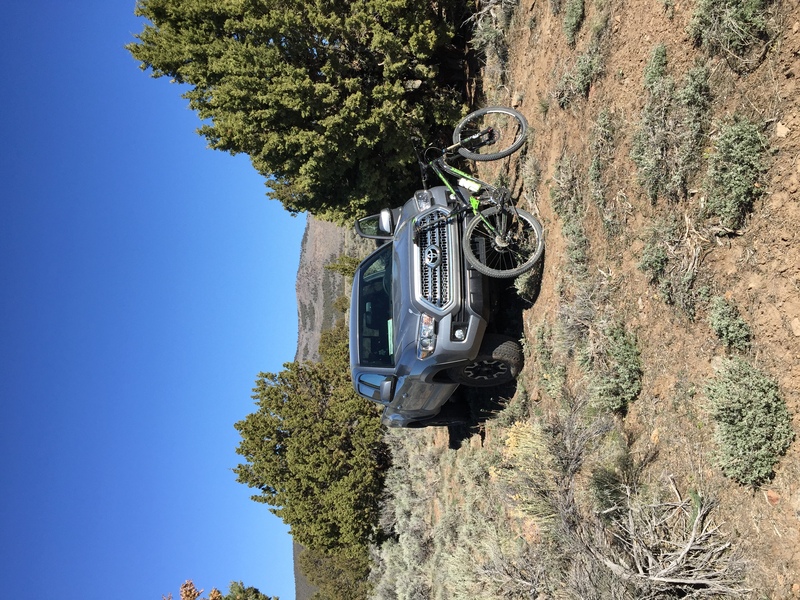 This kind of trip requires a special kind of vehicle; for us, a Toyota pickup truck, and for me, a mountain bike for further exploration. No maintained campgrounds here, we make our own camp, dig a fire pit, and park the vehicle in the trees. 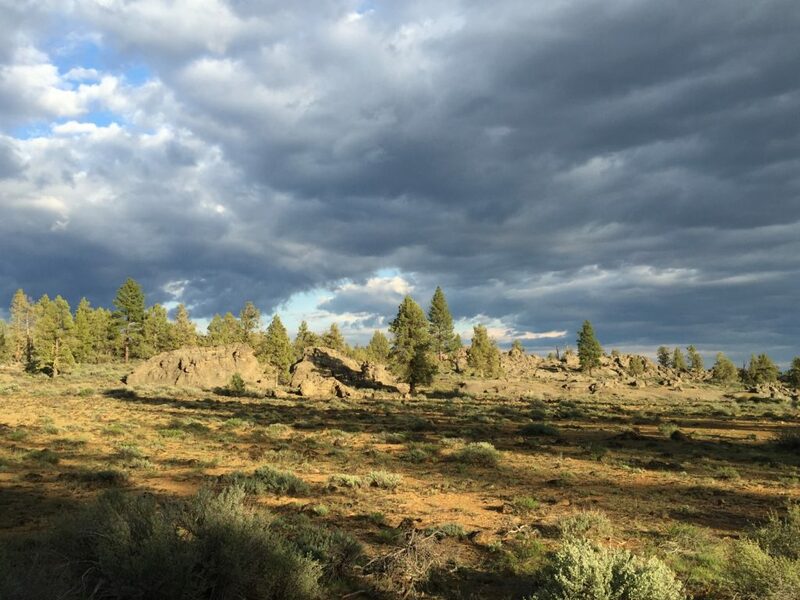 The inland parts of Oregon are mostly dry, near-desert sagebrush steppe. 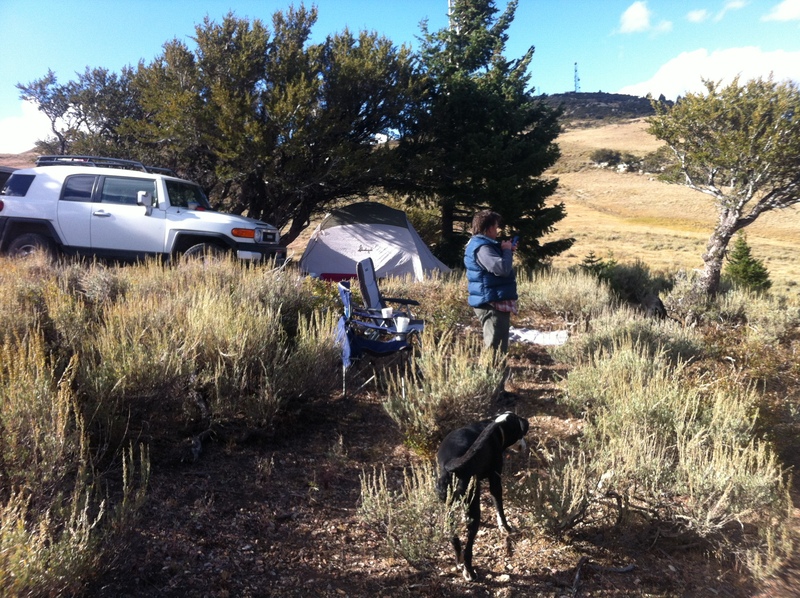 This campsite is dominated by two species of sagebrush, Artemisia tridentata and Artemisia arbuscula, the latter known as ‘low sage’ and former as ‘big sage.’ The elevation here is about 1600 meters, going up onto Juniper Mountain behind camp, which peaks at about 2,020 meters. This kind of habitat sees a long cold winter and a dry hot summer. 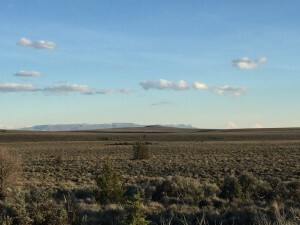 The sagebrush steppe is interrupted in places like this by stands of juniper trees, which utilize certain soil/geological types that suite their need for abundant subsurface water. 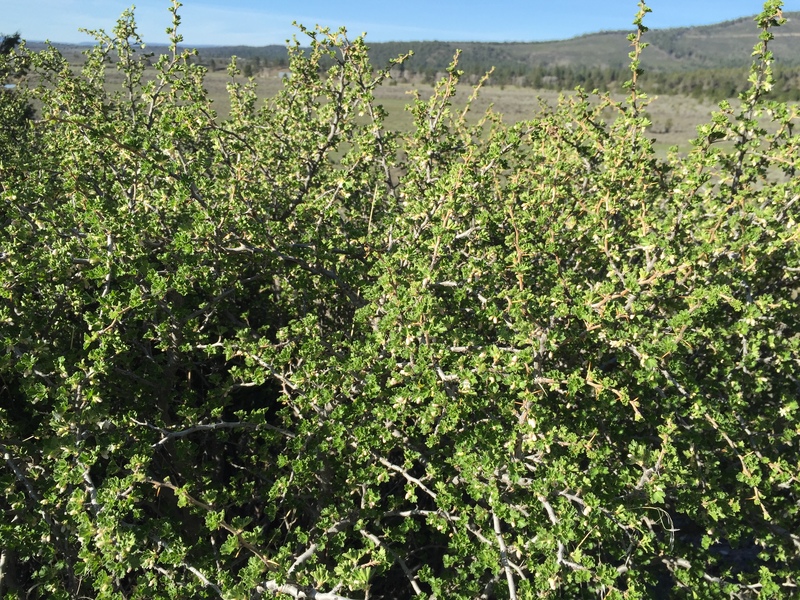 The junipers grow in certain soil- and aspect microclimates. Our camp site is the shiny speck in the trees in the center of the photo (click on the photo to enlarge). As is our way, the first trip of the year was an especially nice weather weekend, sunny, not very windy (mostly less that 15 kph), and warm for this time of year (near 0 C at night, about 17 C during the afternoon). 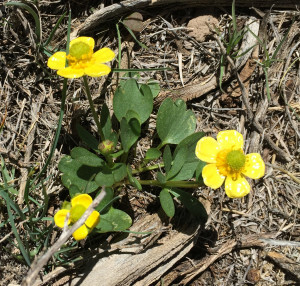 Buttercups (Ranunculus) are common in this kind of habitat in early spring. It feels like good aphid collecting conditions, but here, spring is just beginning. Only a few specialized herbs are in bloom, the grasses are just starting to grow, and the shrubs breaking buds. In another month, this landscape will be full of the colors of desert flowers, including Lupinus, Delphinium, Castelleia, Eriogonum, Crepis, and much more. 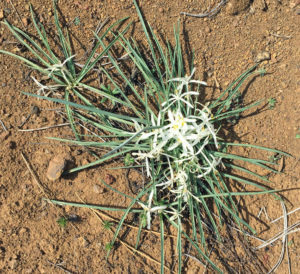 But this weekend, it takes a little hunting to find most of these plants just pushing through the dry dusty soil surface. 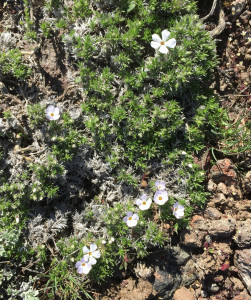 The sagebrush steppe is home to many species of Phlox. This one blooms early in the spring. 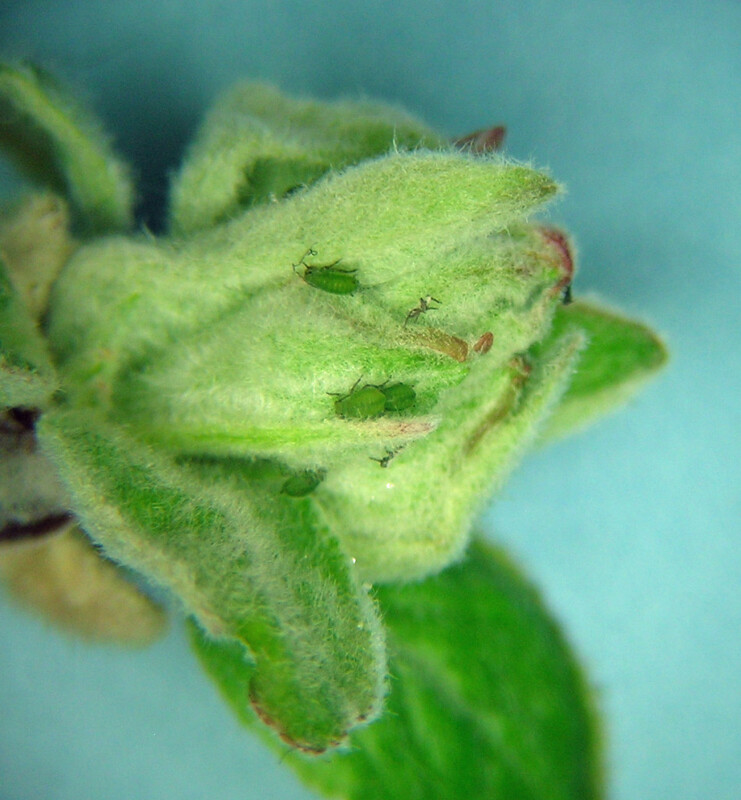 Aphids are few this time of year, but easily detected. The fundatrices of Obtusicauda, Pleotrichophorus, and Pseudoepameibaphis hatched a couple weeks ago from their overwintering eggs on Artemisia and are about 10 days from maturing to adult and beginning the new aphid season in earnest. On the psyllid side, over-wintered nymphs of Craspedolepta are growing again on Artemisia and heading toward adulthood in a few weeks. I don’t collect my bugs this time of year, preferring to stick with collecting adults when they are ready, but a walk through the early spring landscape is just as interesting as any time– it helps put into perspective everything that is to come throughout the growing season for this place. We seek out places like this to study nature, doing our natural history thing, but equally we come here to enjoy the quiet, isolation from human noise, and soak in some amazing wild lands of the west. The road that goes past Juniper Mountain, through a landscape that is shaped by drought and fire. This entry was posted in Uncategorized on April 4, 2016 by aphidman. A prolonged drought has defined life for many people and of course most ecosystems in western North America for several years. 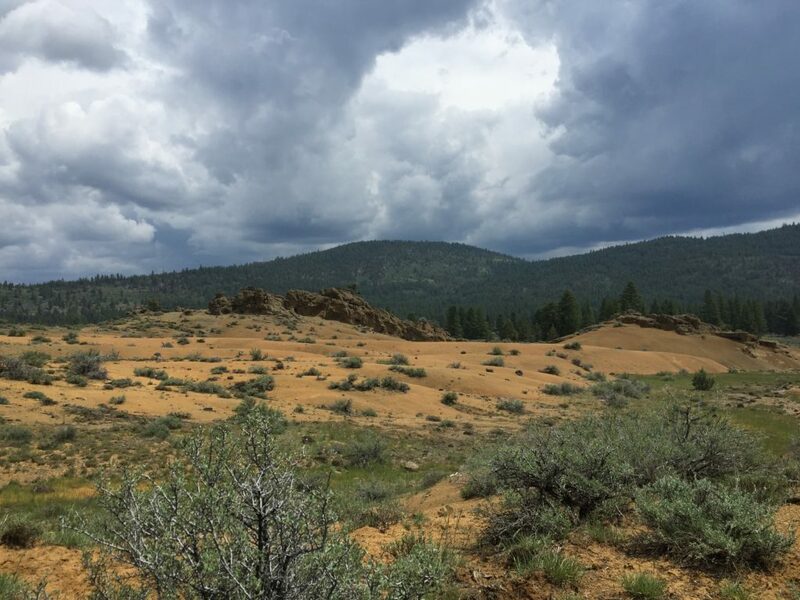 The area of our newly adopted home in southern Oregon experienced an almost completely dry winter of 2014-15, followed by a few weeks of rain in late spring, then a dry spell lasting through September. 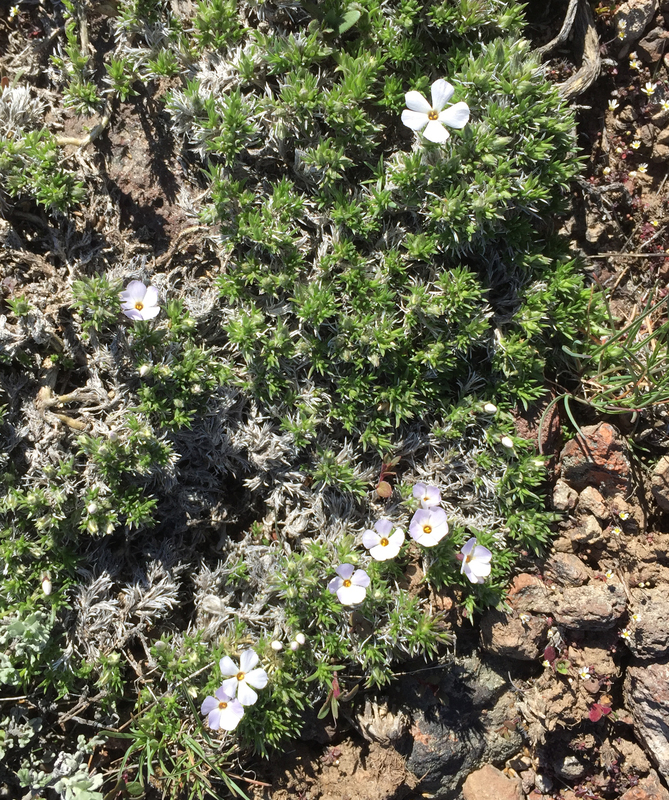 Exploration of the area this fall, we saw very few plants other than trees and xerophylic shrubs persisting even at high and cool elevations. Trees were stressed, failing to reproduce, and/or dying. Even sagebrush and bitterbrush looked tired and dry. Many streams had been dry much of the summer. We were hoping for a snowy winter of 2015-16 to bring the forests, streams, and steppe back to life. Looks like our wishes are coming true! For the first time in a few years the surrounding mountains are buried in snow and the local ski hill at Warner Pass is open for business. The edge of the forested hills above town. The snow should feed a glorious spring in 2016. When I look at the snowy hills, the small trees almost completely buried, I happily ponder the flush of growth we’ll see this spring, the strength of the wildflowers, and hopefully, of course, the burst of native aphids in the early summer. From my office window I can see to the south the edge of the high plateau in the Warner Mountains called Dismal Swamp. I especially look forward to spring up there, where I hope to find more specimens of the enigmatic species of Macrosiphum/Uroleucon I found this fall. 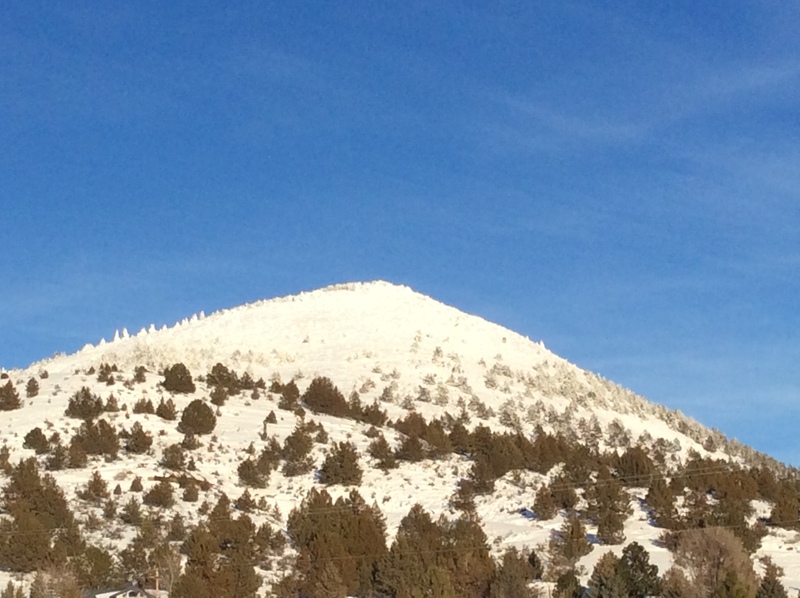 While the snow is inconvenient in the near-term, it is a symbol of promise for a lush and interesting 2016 in southern Oregon! 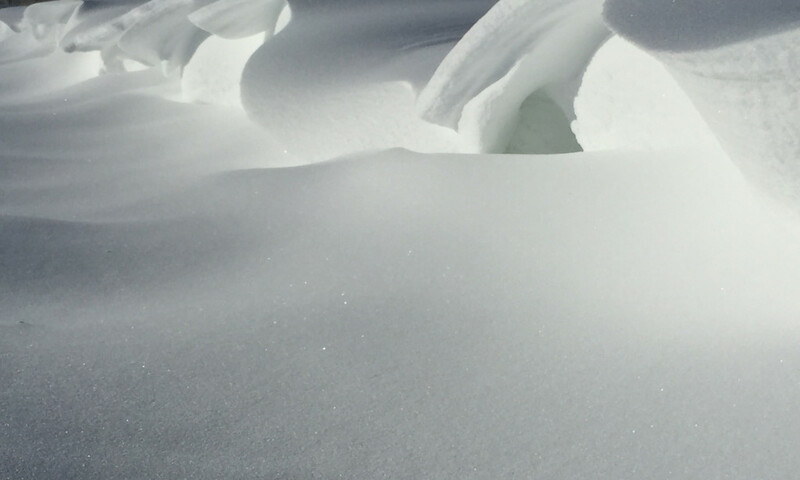 Next spring is waiting to explode under this snow drift! This entry was posted in Uncategorized on December 26, 2015 by aphidman. This year of 2015 we did not get out much, hence the few stories to blog about here. 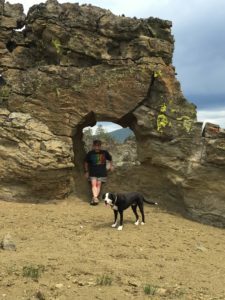 After my spring post about eastern Oregon, June and July were consumed by the emergency medical care for our old dog, who later died. Along the way, we set in motion a home relocation to Lakeview, Oregon! I posted a photo in the last blog entry from a reconnaissance trip to Lakeview and its nearby forests, and that trip sealed the deal. 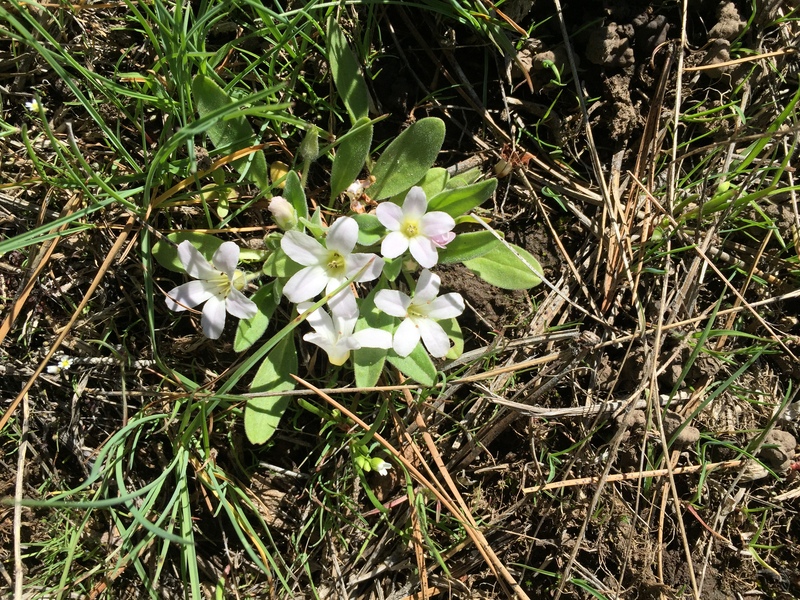 The area is fabulous, in part for the views, in part for the diverse and new plant and insect communities in southern Oregon and northern California. 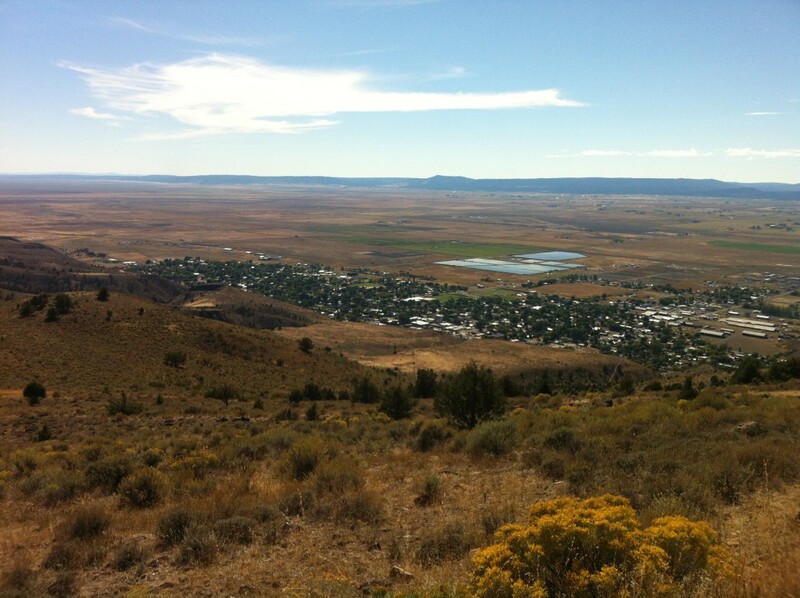 The view of Lakeview, Oregon from the cell phone towers above town. With so much going on at home, plus a 3 weeks trip to Maine and New Hampshire thrown in, we had only a few camping trips since May. Our trip marking our parting with our Idaho home was a final spot on the top of the Owyhee Mountains in southern Idaho. It was Labor Day weekend in early September and we found this spot just below a ridge with a beautiful field of flowers still finishing their life cycle (called a nivation hollow). Aphids were few except on the sage brushes, but as usual treasures are there to reward perseverance. One such find was the final stages of one of the species of Aphis that feeds on Veratrum (corn-husk lily). The biology of this aphid-plant interaction seems complicated, or at least has escaped my understanding for 25 years. There are clearly at least two species of Aphis on Veratrum out west here, but their life cycles are not obvious to me. Black groups of aphids feeding on the nearly fully senesced stem of Veratrum. 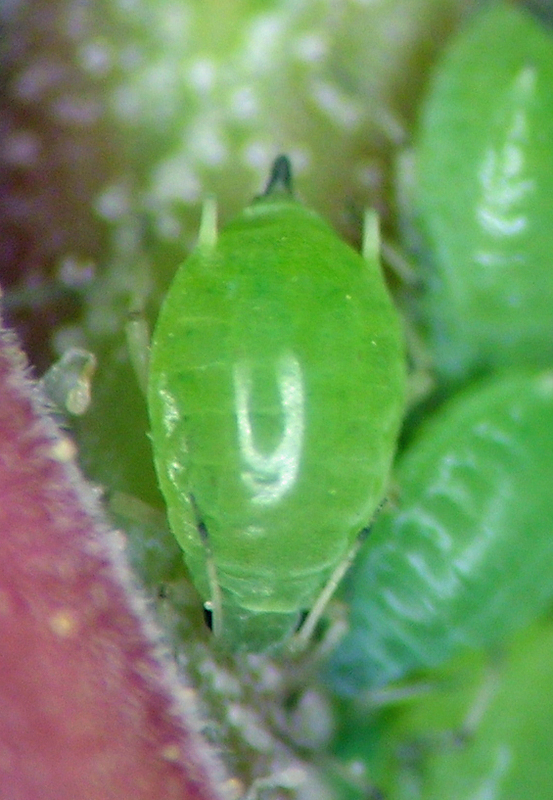 This photo points out the need to recognize aphid host plants in all their developmental stages. 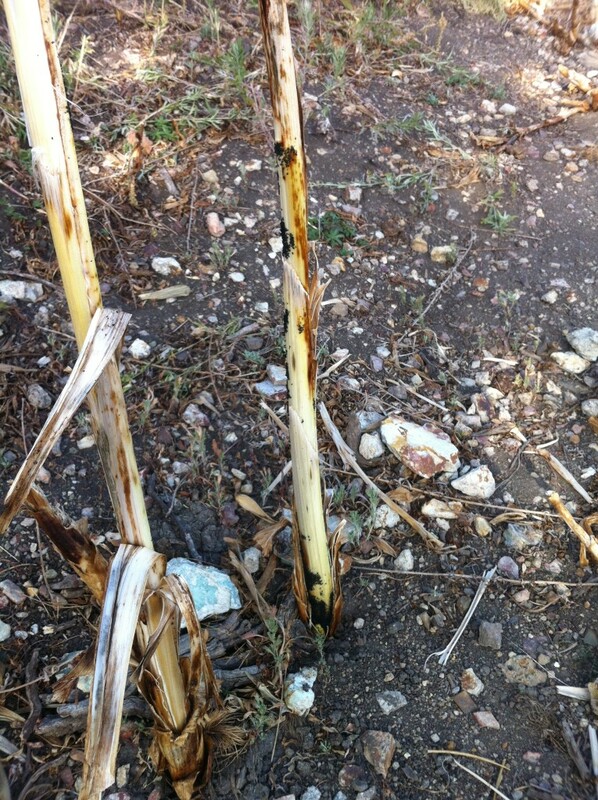 In this site I was able to find the final Veratrum portion of the life cycle of one of the species. I look forward to seeing the slide mounts and maybe take one more step toward understanding the complex of aphid species on this plant. We figure there will be lots of cool stuff to see down the road. Join us! This entry was posted in Uncategorized on October 25, 2015 by aphidman. 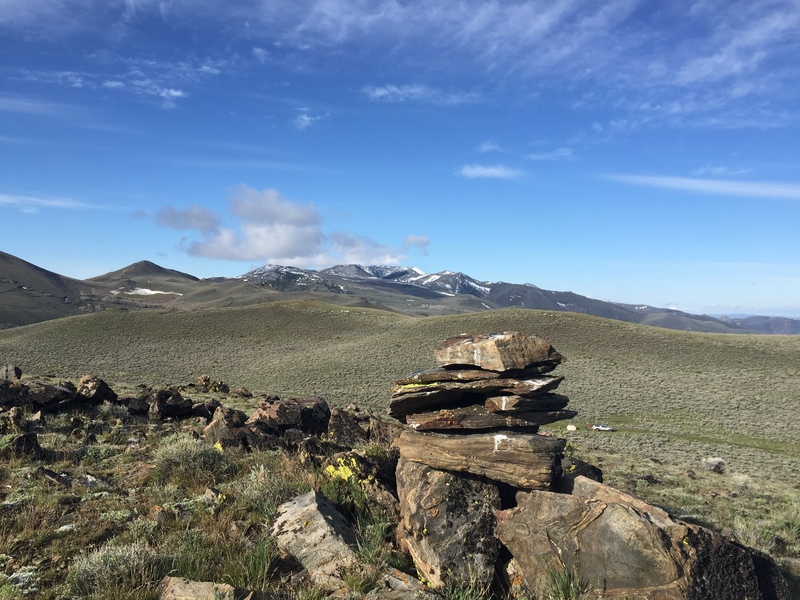 One thing we have learned living in southwestern Idaho is that eastern Oregon is full of great places to camp and explore that are almost unknown to anyone and rarely visited. Spring is the time to visit many of these places because they are relatively low elevation and rather arid during the summer — spring is when they are green and comfortable. 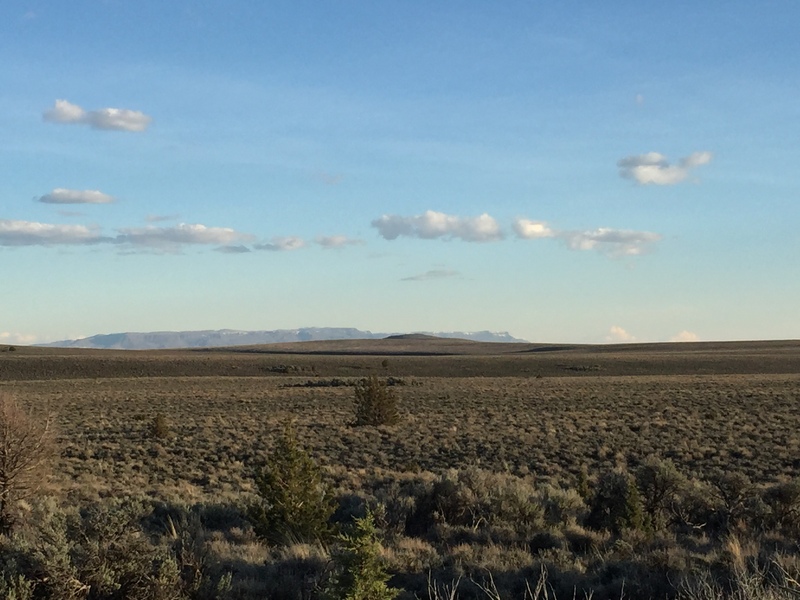 We made 2 trips in May this year, the first to a juniper-sagebrush habitat south of Hwy 20 called Stinking Water Mountains. 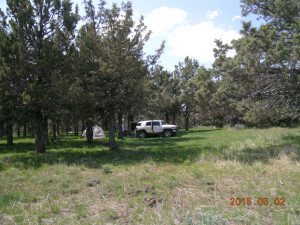 Hunting camp among the junipers, Stinking Water Mts., Oregon. We drove past wild horses and through the remains of a recent range fire to arrive at this huge hunting camp (hunting camps are used by hunters in the fall hunting season, and only by the occasional back country camper the rest of the year). 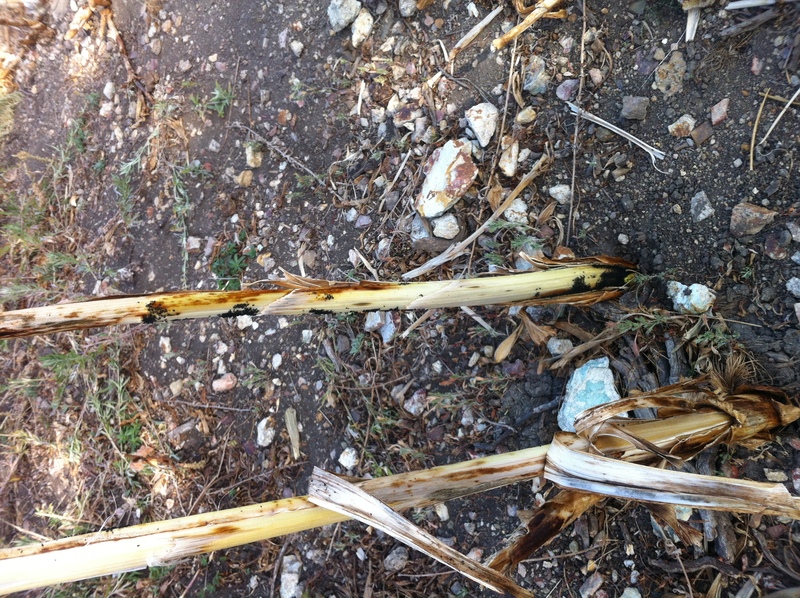 It was still early in the season at this site, but a few aphids and psyllids were found. 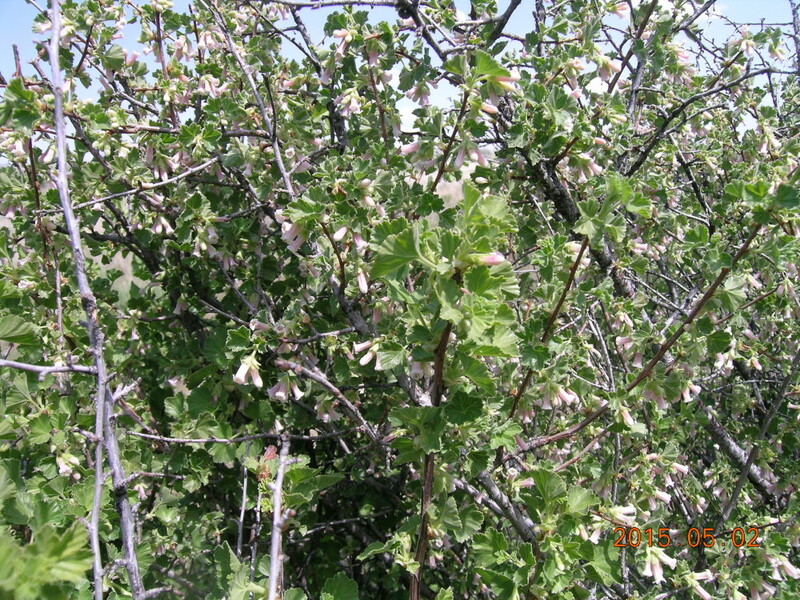 One of the plants I study for the biology of Nasonovia (Kakimia) and Aphis (Bursaphis) was common: Ribes cereum. 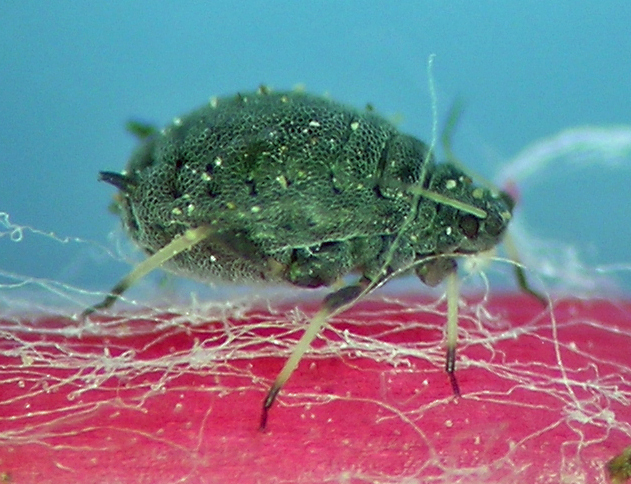 This is the host for some well-known aphid species, and some that seem to be poorly known or undescribed. 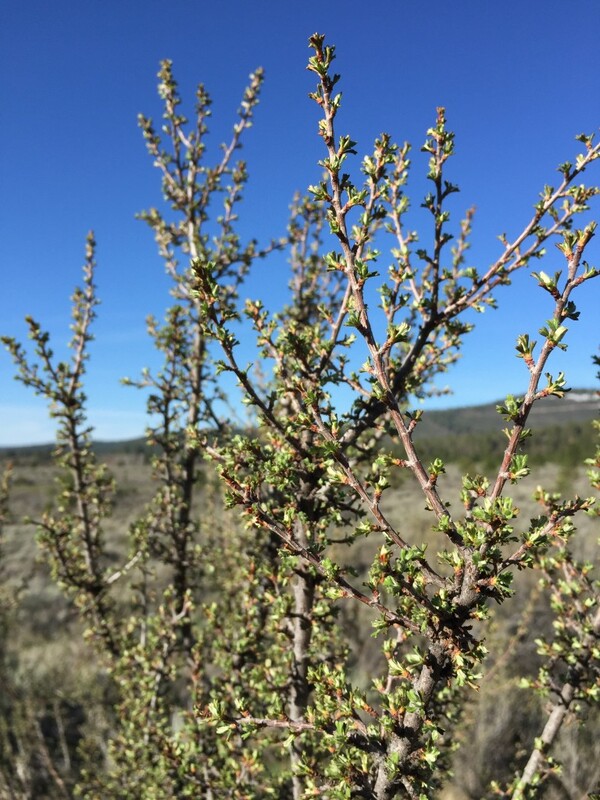 It is among the first plants to break dormancy in spring, and the aphids are right there with it, developing in the coldest spring weather these high deserts can dish out. The second trip was to the mountains outside Lakeview, Oregon, called the Warner Mountains. While most years this area would have been under snow on Memorial Day, climate change and a warm winter let us reach almost anyplace we wanted to without snow. There was a threat of rain here and there, but fabulous weather, with temperatures above 10C most of the time and clouds floating by to mix up the sky. Aphids were not abundant, but some unusual finds were made nonetheless, including my first ever collection on the uncommon sagebrush called Artemisia spinescens (on the way home, heading toward Denio, Nevada). Our camp was set up among some fabulous giant ponderosa pines. 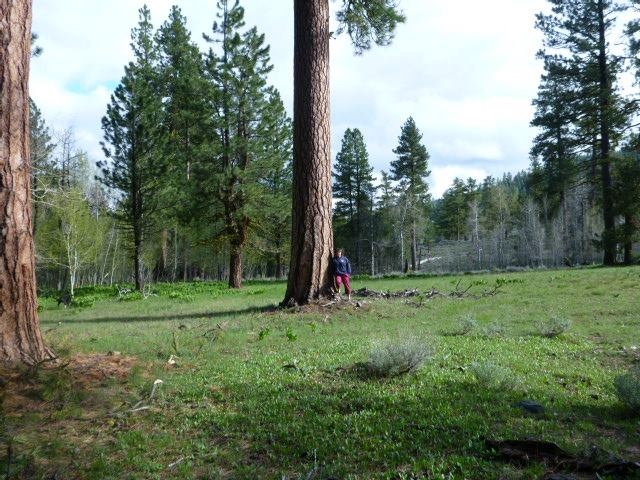 Gina with one of the ponderosa pines at camp. This entry was posted in Uncategorized on June 1, 2015 by aphidman. 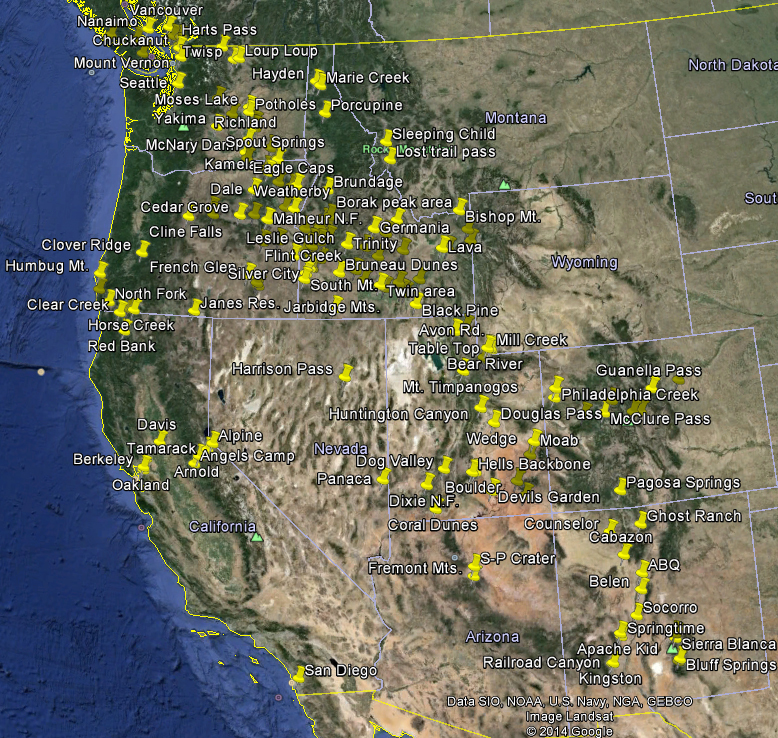 Just some of the places we’ve been since 2011, almost all camping spots. sights seen. We get out a lot, using mostly my Toyota FJ Cruiser to access remote back roads, and quite a range of equipment and supplies for tent camping in dispersed camping settings (i.e. without campgrounds, tables, restrooms, etc.). We see some amazing sights, explore habitats on the edge at high altitudes, and camp in the cold, rain, snow, wind, and plenty of perfect sunny calm days. Food is by no means standard camping food; no hotdogs, hamburgers, or potato salad to be found at our camps. Often we cook Thai curries, Indian-style lentils with spinach, fajitas, pasta with home-made tomato sauce. The dogs lounge in the shade (or sun, if it’s cold out! ), and we stay up late watching the stars and warming our feet by a camp fire. Morning is insect collecting time, anywhere from 2 to 4 or 5 hours depending on the season, location, and difficulty of the terrain. A fall camp in the mountains of central Idaho, near Fisher Creek. This entry was posted in Uncategorized on April 2, 2015 by aphidman.